You acknowledge and agree that you will access and use the Services at your own risk. All Digital Assets involve risk. Digital asset trading also has additional risks not experienced by digital assets or other commodities on the market. Unlike most currencies guaranteed by the government or other legal institutions, or by gold and silver, digital assets are a unique digital asset and are guaranteed by technology and trust. There is no central bank that can control, protect the value of digital assets in a crisis, or print the currency. Indonesia Digital Exchange does not guarantee the long-term continuity of bitcoins and other digital assets that are traded or exchanged in this marketplace. With regard to bitcoin mining activities need to be straightened out and confirmed that we do not carry out mining, producing or printing bitcoin activities. Bitcoin was created and mined using special software by miners that were scattered randomly throughout the world and connected with peer- to-peer technology on the blockchain network. Risk of internet transmission. You acknowledge and acknowledge that there are risks associated with using an internet-based trading system including, but not limited to hardware, software and Internet connection failures. 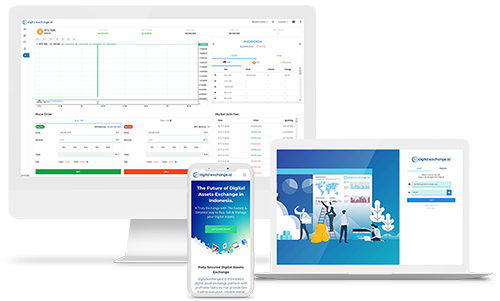 You acknowledge that digitalexchange.id is not responsible for communication failures, interruptions, errors, distortions or delays that you may experience when trading through the Service, regardless of the cause. All points mentioned above apply to all legitimate digital asset trading markets. This brief statement cannot, of course, reveal all the risks and other aspects related to this trade.